Melilotus melilotus indicus Asch. & Graebn. 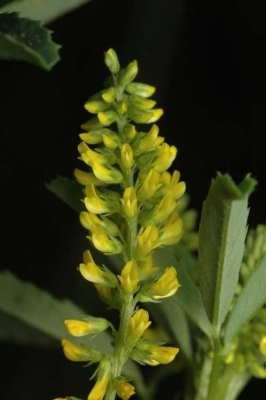 Melilotus indicus is an erect, annual herb growing about 1 metre tall. The plant is sometimes harvested from the wild as a local source of food medicines and as an insect repellent. The plant contains coumarin, a substance produced by the plant because it acts as an appetite suppressant and gives some protection from grazing - it is also the compound that gives some dried plants the smell of new mown hay. Coumarin is found naturally in many fruits, including strawberries, black currants, apricots, and cherries; it also has some medicinal applications, though it is also known to be toxic, affecting especially the liver and kidneys. Coumarin is of relatively low toxicity to humans – indeed it has often been used as a flavouring and aromatic additive in foods and other commodities. However, it can be much more toxic to other species, especially rodents and specifically rats. The fresh plant material, consumed in moderation, is generally safe. However, the dried plant material, especially if it is not dried properly and is invaded by fungi, is potentially much more toxic as the coumarin breaks down to form other compounds that can have a strongly anticoagulant effect upon the blood. Warfarin, a well-known anticoagulant drug and rat poison, is one of those compounds produced from coumarin. Southern Europe - Portugal to Greece; Northern Africa; eastern Mediterranean through central Asia to China, Pakistan, India and Nepal. ]. Germination will usually take place within 2 weeks.